Hey, it’s me here to give you some BIG news! I am moving into a van! That’s right folks, you heard it straight from the horse’s mouth, I am officially jumping on the Van Life wagon. The last week of May I will be hitting the road full time for elopements and adventure sessions. Woah!! Big change right?! This has been a long time coming, but let’s back it up a little bit…. 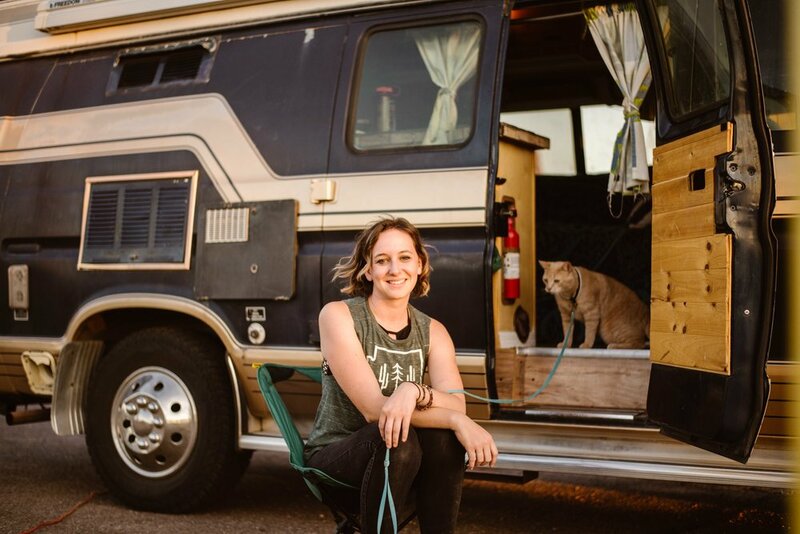 Van life first sparked my attention a little over a year ago after I left a corporate photography job with Montana Pritchard Photography to head to Arizona. I have always followed along other people’s van life adventures and dreamed of doing it one day, but it never felt like a real possibility between all of the daily things we get caught up in life. It is funny how things fall into place in your life and eventually you get to where you were really always headed. I think back and laugh at all the states I have moved to, the constant traveling and all the people who have said to me I will never stay in one place. Here I am just me and my two cats jumping into a van to travel the United States! Ever since making the life change to be an adventure elopement photographer I knew deep down at some point I would figure out how to make van life happen for my job and myself. I love to travel and moved to Arizona to be closer to all the places I wanted to explore in the West and closer to adventure for my couples eloping. I quickly found that traveling every once in a while to places outside of the desert was still not enough for me. For elopements the desert is a gold mine, but during the summer it is not ideal. This first year of business I kept thinking about all the places I want to work with my couples to offer them the best experience, depending when they want to elope. I can not wait to offer elopement photography in places like Colorado in the Spring, the Pacific Northwest during the summer, Iceland and other places in the Fall! The ability to be where ever, whenever is so appealing and to spend down town in the woods or the desert surrounded by solitude is even better! Moving over 17 times in my life I know how to pack up my life and start it over somewhere else, but the task of transitioning to Van Life was very overwhelming for me. I joined a lot of Facebook groups in the van community and started asking questions just out of curiosity back last June. Some people were very helpful and I grew a small community that helped me in my search and tips for living on the road with cats and as a solo female. Then earlier this year in February I had the chance to meet and chat with the The Hearnes about their advice for being on the road full time as a photographer at the Adventure’s Workshop. Abbi listened to my thoughts and questions and her answer was simple, “Get Amongst it” and that truly stuck with me. Once I started going to check out vans I found mine within two weeks locally. I bought a 1989 Ford Ecocline 250 that had been built out by the previous owner just a couple of weeks ago. I named the van Chance after a story my aunt told me about my grandfather who always credited his success to simply taking a chance. If you follow along on my Instagram you know I have two fur babies. My cats were going to be apart of this no matter what because they’re like my family. My girl, Sophie who is 9 loves car rides and my boy, Indy who is 6 loves hiking. Cats adjust and adapt really well and are very trainable, they just take a lot more patience than pups. There is some information already out there about van life with cats and how to move them into the van full time without making it a terrible experience. I have been documenting my process with my two cats and will be sharing on Instagram and YouTube. So far they have adapted well and I am excited to see them transform into little van life cats as we go into the van full time. Between now and the move in I am making sure the van is ready to go road wise, work wise and life wise. So far I have taken the van out twice for a camping trip and both times have been huge learning experiences. I move into the van full time at the end of May after elopements I have in Sedona then I’m heading to work in Colorado and North Carolina for the month of June. After that I have laid out a generally travel schedule, but it is subject to change based on life and bookings. I know many of you want to see a tour of the van and I promise to keep you all updated on social media as this journey really starts to kick off. Also, huge shout out to my amazing friend and beautiful client, Izzy for coming out to the Lost Dutchman State Park to photograph me and my kitty poos! I can’t wait to capture your connection! Want to read more about this life change? Check out my article on Van Life: Dwellers, Nomads & Vagabonds.